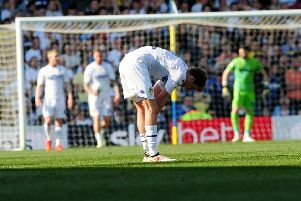 Depleted Leeds United suffered another defeat on their travels as they came away from Preston North End with a 3-1 defeat. Paul Heckingbottom has yet to experience an away win as Whites head coach and saw his team surrender a half-time lead with a mad three minutes early in the second half costing his patched up side dearly. Kemar Roofe gave United a 13th minute lead, but quickfire goals from Paul Gallagher and Sean Maguire turned the game round after the break and Preston went on to score again through Alan Browne to make it four defeats and two draws in the six away games in Heckingbottom’s time in charge. With eight players missing through injury and Gaetano Berardi suspended it was something of a scratch side named by Heckingbottom and he surprised fans by leaving out Samuel Saiz and Ezgjan Alioski, who had good games at the weekend. In their place were Jay-Roy Grot, given a rare start up front, and Roofe with Caleb Ekuban recalled at the expense of Pierre-Michel Lasogga. In at left-back was Vurnon Anita while young defender Paudie O’Connor retained his place at centre-back. Perhaps not surprisingly it was Preston who started the brighter as Tom Barkhuizen sent an early warning shot over. But the hosts were stunned as top scorer Roofe marked his return to the starting line-up after a calf injury by putting United ahead in the 13th minute. Kalvin Phillips produced a great cross and Roofe was left unmarked at the back post to open the scoring. Preston looked to hit back, but Maguire could not keep a header on target and they were unlucky when Barkhuizen hit the post with a shot from just inside the area. At the other end, Pablo Hernandez forced a save from keeper Declan Rudd with a shot from the edge of the box after being set up by Stuart Dallas. Ekuban also had an effort saved following good work by Phillips and Hernandez. Right on the stroke of half-time Roofe almost got on the end of a clever ball by Hernandez, but Rudd was able to collect. Into the second half Preston hit back when awarded a penalty after Anita was adjudged to have brought down Billy Bodin and Gallagher stepped up to score from the spot. As so often this season one goal turned into two conceded as the Leeds defence fell apart. Only a good save by Bailey Peacock-Farrell kept out a Browne header, but the relief was only temporary as from the resulting corner Gallagher’s cross was headed home by Maguire. There was more bad news for United with key defender Pontus Jansson having to go off injured, to be replaced by 21-year-old Hugo Diaz, who came on for his first team debut to complete a back five no-one at the club would have ever dreamed of seeing. They kept going, however, and Ekuban saw a shot blocked. Heckingbottom threw on Saiz and Alioski in a bid to turn things back round and Hernandez got a shot in that Rudd saved. The home keeper then came to his side’s rescue when he produced a top save to deny Ronaldo Vieira’s well struck shot from distance. However, just as it seemed it would be Leeds scoring next they conceded a third as Browne’s header looped over Peacock-Farrell into the net. The final score was a bit harsh on a Leeds side that tried hard, but was just too short on quality. The end of the season cannot come fast enough for most fans. Preston: Rudd; Clarke, Huntington, Davies, Cunningham; Pearson, Gallagher (Harrop 65); Bodin (Horgan 84), Browne, Barkhuizen (Robinson 76), Maguire. Leeds: Peacock-Farrell, Dallas, Jansson (Diaz 56), O’Connor, Anita, Vieira, Phillips, Hernandez, Roofe (Saiz 66), Ekuban, Grot (Alioski 66).